The Kalene Mission Bookroom is comprised of three rooms: a storage area, which was the original (1974) bookroom building, a library/study area with a small washroom, and a selling area, both completed in 1987. In August of 2004 the responsibility for the Kalene Mission Bookroom was placed into the hands of a committee. This has worked well as one of the committee members is always here to carry on the work. Karen Loudon, Marilyn Poidevin and Richard Reed are committee members. This has continued over the years but presently is not functioning as a library. New procedures need to be put in place for the borrowing of books. Folk interested in doing Bible study using the Emmaus Bible courses have come here in the past to give and get lessons and discuss difficulties in questions. This is now continued on the selling side. Lessons are sold, marked, and ready for the student to pick up. In addition, this area is used each Tuesday for a men’s Bible Study led by John Loudon. It has been an encouragement to many in the area of Kalene. We are open Monday to Thursday, from 0800 hrs to 1100 hrs. We have been most encouraged with how the Lord has led in this work over the last nine years. Sales of Bibles in 7 languages have increased. Books received from Everyday Publications in Portuguese, French, Swahili, and English have been a great boost for the bookshop. All the shelves are full and more shelves are needed. 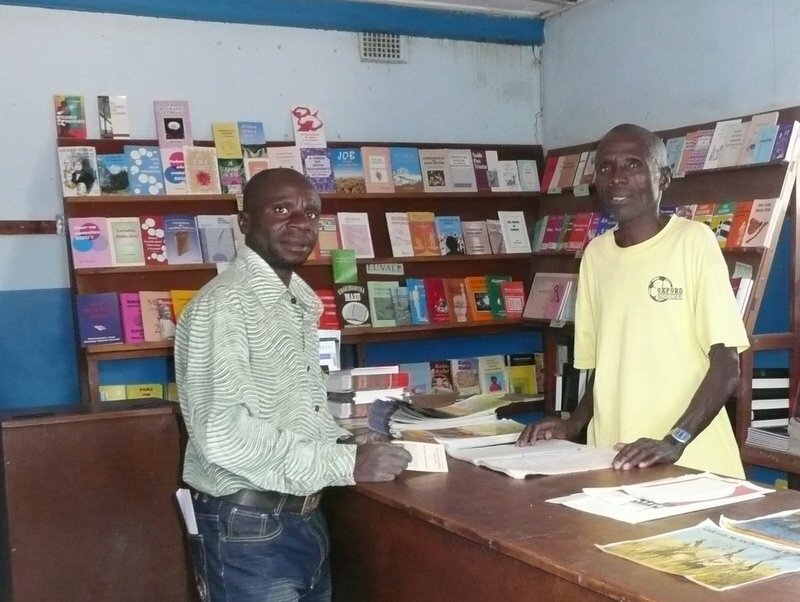 Once the Angolan border was re-opened, we ordered books from Luvale Publications. Lunda, Luvale, Portuguese, Chokwe, French and English tracts are bought from Bellville Evangelical Christian Press in Cape Town, South Africa. Stationery supplies are brought in for the local children attending Kalene Basic and High school as well as students from the School of Nursing. In holiday time, people travel from a distance to purchase school items. Each person leaves the bookroom with a tract in his/her own language or a Sunday school paper for the children. We also supply the Bible Knowledge courses for the grades 10, 11 and 12 which are used in the high schools in this district. We are grateful for the number of books going into Angola and Congo. These have gone across with patients who have come for medical treatment and also some full time Congolese workers. 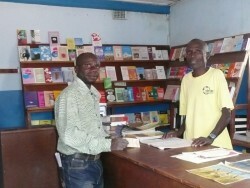 The Lord has opened up a way to get French and Swahili Bibles and Bible helps to Kolwezi, Congo. Since the School of Nursing re-opened in 2007, a greater number of English books and Bibles has been purchased. In June 2009 Eliza Samulozanga retired. A four bedroom home was built for her retirement. Mr. Frank Kafwolesha, who lives an hour away by bike, started to help on Tuesdays when he came to Mr. Loudon’s Bible study. This time was extended, and as of May 2010 Mr. Kafwolesha is now a full time employee. He has done a great job and sales have increased. From September 2011 to November 15, 2012, the Lunda Bible was out of print. What a thrill to have it on our shelves once again! In two months we have sold 80 Lunda Bibles. We thank Echoes of Service and Opal Trust who set up a revolving fund so the Lunda Bible can continue to be printed and be in stock. This is a project that is definitely necessary. Major renovations of each room are needed. A new display area, more storage shelving, paint inside and out, and a new washroom facility are needed. We are grateful for two gifts received for this work.